I provide this document so you can read about the typical database set up steps using the Structured Query Language (SQL) and can investigate the database schema we agreed upon together. 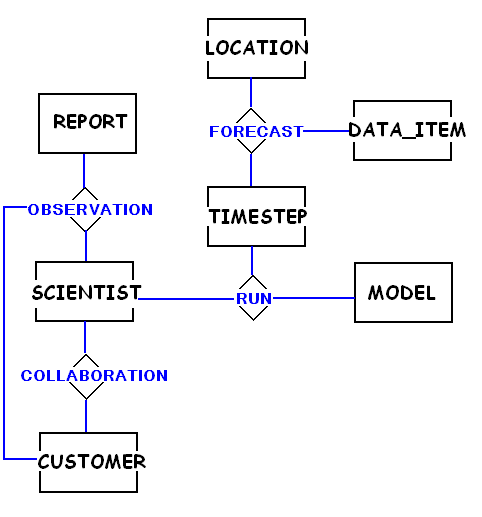 Remember that our schema comes out of a modeling exercise document called an Entity-Relationship Diagram: Our Project 3 (environ) database is created via a simple createdb call made to the Postgres postmaster. The createdb command sets up a standard database shell and allocates starter space in the database storage area on the server hard drive. I plan on updating this document to represent any changes to the database that we agree on upon your review of the choices we made in class on April 26th. As you learn SQL, you will be able to try out your SQL SELECT Commands via our class SQL Select Tool. Then, you will be able to INSERT new records to the environ database using our class SQL Insert Tool. Welcome to psql, the PostgreSQL 8.0 interactive terminal.